Fig 1.1: SCP-4127 (prior to neutralization). Special Containment Procedures: SCP-4127 is to be kept on-site in a secure low-risk containment vault. Additional testing is prohibited at this time. 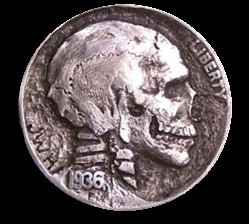 Description: SCP-4127 is a 1936 USA Buffalo nickel that depicts a buffalo on one side and a human skull on the other. When flipped, SCP-4127 always lands head-side up. SCP-4127 was previously documented in the anomalous object log; however, an additional property was discovered in 2006 by a janitor during routine maintenance. When the coin is flipped immediately after the subject describes an event conditional upon the flip, the result of the flip will determine the event's outcome. "Heads, I get a promotion." Heads Emilio Rodriguez (a janitor at Site-96) is called to Site-Director August's office to receive a promotion for his conduct. During this meeting, Mr. Rodriguez mentions having flipped the coin only minutes prior (leading to its discovery and designation). Given that his honesty is what led to SCP-4127's discovery, the promotion is upheld. "Heads, my quarter's next flip will come up tails." Heads A non-anomalous quarter is flipped; it comes up tails. "Heads, the next ten flips with my quarter will come up tails." Heads The non-anomalous quarter is flipped ten times. It comes up tails each time. "Tails, my quarter will come up tails at least once in the next ten flips." Heads The non-anomalous quarter is flipped ten times. It comes up heads each time. "Heads, I'll get a call in the next five seconds." Heads Researcher Rogers immediately receives a call from his wife reminding him to pick up their son from school. "Heads, I'll get a call from the Publishers Clearing House Sweepstakes committee in the next five seconds." Heads Researcher Rogers immediately receives a call from a representative of the PCH Sweepstakes committee. During the ensuing conversation, it becomes clear the committee member has dialed the wrong number. "Heads, I'll become filthy rich." Heads A sewage main bursts in the bathroom, flooding the lab with raw excrement. Shortly thereafter, Researcher Rogers receives a phone call from an investigator hired by his biological mother. During the ensuing conversation, he is informed that his birth-name is 'Richard'.